SEPVER Mall RX9 - Package includes: 1 x smart watch 1 x usb charging cable 1 x user manual main functions make calls or answer calls send and view messages sync calls sync messages notifications for Facebook Twitter Wechat Whatsapp pedometer sleep monitoring sedentary remind Image viewer Sound recorder need put a TF card Audio player Remote capture Alarm Two way Anti lost Phone book browser calendar calculator. About us: our brand "sepver" trademark has been registered in US, and also registered on Amazon. Please note 4 :sync message, sync notification, remote capture, Anti lost functions not work for iPhone. Please note 2 : image viewer, Sound recorder, Audio player, need put a TF card in this smart watch. 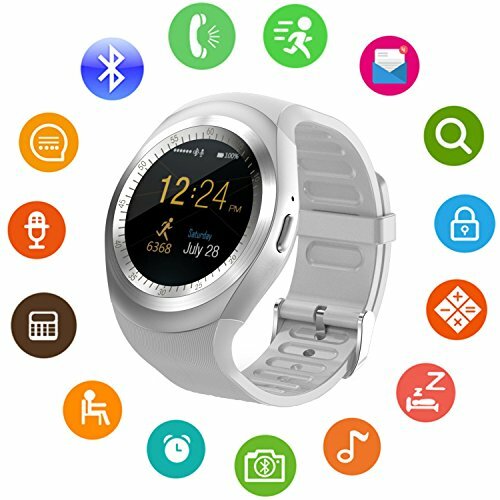 Tf card maximum support 32gb please note 3 : if you want to use this smart watch to work without a mobile phone, you need to put a SIM card into this smart watch, it only supports Nano SIM card: GSM/GPRS 850/900/1800/1900 the SIM card is not included. SEPVER Smart Watch SN05 Round Bluetooth Smartwatch with SIM Card Slot Compatible with Samsung LG Sony HTC Huawei Google Xiaomi Android Smart Phones for Women Men Kids Boys Girls White - User need to press the start button to make the pedometer to count steps and the smart watch start to count steps after the user walk for more than 20 steps For Sleep monitor our smart watch has the sleep monitor user need to press the start button to make the smart watch monitor the user sleep quality no need any APP they just need to wear the smart watch to sleep. Secondly, then then watch will work well with the smart phone, Run the Funran APP, connect the watch with the Android smart phone by bluetooth, and all features works. Please note 1 : remote notifier, Remote capture, Anti lost, need download an App in your Android smart phone. Use as an independent phone if you put a nano sim card in this smart watch you can make phone calls directly from the smartwatch including answering and dialup ou can also send and view messages by the smart watch We recommend the Tmobile GSM SIM card HD Display Full round screen smart watch High sensitive capacitive touch screen Perfect matchtechnology Resolution ratio 240x240 pixel 1 year quality warranty and 24 hours email service. SpeedTalk Mobile - Our sim cards can be use with any gsm tracking device such as but not limited to: gps trackers kid GPS Trackers Pet TrackersTrackers for Seniors Car Alarm Systems Smart Watches Enterprise, Corporate and Affiliate Accounts are available - online account management portal and API's to manage multiple SIM cards within single account and one main airtime balance. Some use text messaging to locate the tracker, other devices use data connection. Check coverage at stkmap To activate please visit us at ActivateSpeedTalk. Roaming is not supported in this plan. Service begins as soon as you activate your service. Either way, our service offer voice call, text and nationwide 2G 3G & 4G LTE Data. $7.50 GSM SIM Card for GPS Tracking Pet Senior Kid Child Car Smart Watch Devices Locators 30-Day Wireless Service - Our service will only work within the United States. Roaming is not supported in our plans. That's 375 minutes or 375 texts or 375 MB Data. Our sim cards are designed for users that need a minimal amount of airtime each month/year. You'll be charged the rate stated at the time of purchase, every month, until you cancel. No Contract. Our service will work within the United States Only. A valid credit card is required to cover overages in case you exceed the applicable Voice, SMS and Data limits. T-Mobile T-Mobile Complete SIM Kit - No Contract. That's 375 minutes or 375 texts or 375 MB Data. Our sim cards are designed for users that need a minimal amount of airtime each month/year. Use any t-mobile or comptible GSM unlocked phone or tablet. With t-mobile: no annual contracts, overages or credit checks. Roaming is not supported in this plan. Buying an unlocked, compatible phone or tablet? This Complete SIM Kit allows you to choose a plan and connect to T-Mobile's Nationwide 4G LTE network. Punch out the ready-to-use nano SIM, slip it into your phone or tablet, and you're ready to go. Use any t-mobile or compatible GSM unlocked phone or tablet. T-Mobile Prepaid Complete SIM Starter Kit - With t-mobile: No annual contracts, overages or credit checks. For Prepaid usage. Siim is pre-cut in 3 sizes to fit any device, standard-sized SIM, Micro-sized SIM or/and a Nano-sized SIM card. Supports gps tracking devices such as but not limited to vehicle trackers, personal tracker, kid/pets tracker, senior tracker. No activation fee. California proposition 65 WARNING: Cancer and Reproductive Harm. Ready to use. Amazon SR043KL - The best of prime if you haven't tried Amazon Prime in the past, we'll give you a 30-day free trial. That's 375 minutes or 375 texts or 375 MB Data. Our sim cards are designed for users that need a minimal amount of airtime each month/year. Use any t-mobile or comptible GSM unlocked phone or tablet. Play fire tablets feature instant access to over 600, premium TV and movie provider apps, 000 of the most popular free and best-selling games, social media, and so much more. For example, you can drop in to ask what time dinner will be ready, see the baby's nursery, or check in with a close relative. Siim is pre-cut in 3 sizes to fit any device, standard-sized SIM, Micro-sized SIM or/and a Nano-sized SIM card. Supports gps tracking devices such as but not limited to vehicle trackers, personal tracker, kid/pets tracker, senior tracker. with Special Offers - Fire 7 Tablet with Alexa, 7" Display, 8 GB, Black - No activation fee. Compared to the previous generation, Fire 7 features an improved display that provides higher contrast and sharper text. Calling and messaging ask alexa to call almost any local number, or video call friends and family who have a Fire Tablet, message your contacts, Echo Spot, Echo Show, or have installed the iOS or Android Alexa App. Complete sim kit allows you to choose a plan and connect to T-Mobile's Nationwide 4G LTE network. Choose from top titles including Candy Crush Saga, Township, Mobile Strike, and more. Fast and responsive The fast quad-core processor consists of four high-performance 1. SpeedTalk Mobile - No credit Check. 8 or 16 gb of internal storage and a microSD slot for up to 256 GB of expandable storage. Just ask alexa for quick access to the information and entertainment you want. You will need a sim card to enable tracking services to work and communicate with the tracker remotely via the phone number associated with the SIM card. Make sure you turned on the power in your device, in a good reception area. That's 250 minutes talk or 250 texts OR 250 MB Data. Our sim cards are designed for users that need a minimal amount of airtime each month/year. Roaming is not supported in this plan. Buying an unlocked, compatible phone or tablet? This Complete SIM Kit allows you to choose a plan and connect to T-Mobile's Nationwide 4G LTE network. SpeedTalk Mobile $5 GSM SIM Card for GPS Tracking Pet Senior Kid Child Car Smart Watch Devices Locators 30-Day Wireless Service - USA Canada & Mexico Roaming - Punch out the ready-to-use nano SIM, slip it into your phone or tablet, and you're ready to go. Use any t-mobile or compatible GSM unlocked phone or tablet. Either way, our service offer voice call, text and nationwide 2G 3G & 4G LTE Data. Our sim cards can be used with any gsm tracking device such as but not limited to: GPS Trackers Kid GPS Trackers Pet TrackersTrackers for Seniors Car Alarm Systems Smart Watches Buyer needs to contact the manufacturer or seller of their defective/not working 3rd party device. Complete sim kit allows you to choose a plan and connect to T-Mobile's Nationwide 4G LTE network. There is no contract, Cancellations can be made any time by contacting customer support.